High Times may have made BREED HISTORY with OTCH-MACH High Times Whata Hoot *** UDX MH - owner/handler/trainer Bridget Carlsen on June 6. 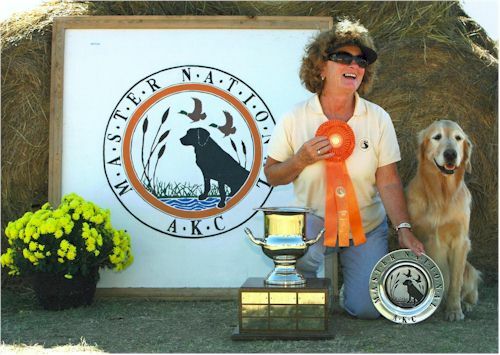 We believe Hooty may be the only Golden Retriever in the History of Golden Retrievers to have earned these combined titles. CONGRATULATIONS ARE IN ORDER IN SPADES!!!! High Times Goldenloch Soul Shaker*** CDX MH (aka Preacher) enters Master National Hall of Fame and brings home the Women's Challenge Trophy for Nancy. Maize owned by Deb Blackwell - New Senior Title! 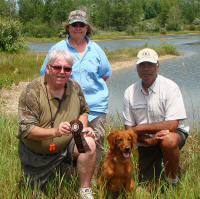 Yankee owned by Cheryl Kistner and Marilyn Wilcox - New Senior Title! Wonka owned by Becky and Russ Brewer - New Junior Title! IKE owned by Bryan Gunther - New Junior Hunter title! Remy owned by Roseann Porucnik - New WC Title!!! Chaser owned by Roseann Porucnik - New WC Title!!! Chaser owned by Roseann Porucnik - New WCX Title!!! Jersey owned by Hope and Ivan Stauersboll - new Master Hunter!!! Scarlet owned by Katherine Bornhofen - New Junior Hunter!!! Trumpet owned by John and Nancy Miner - New Junior Hunter!!! Addie owned by Lisa and David Schmidt - New Master Hunter!!! Maize owned by Deb Blackwell - New Junior Hunter!! !